If you don't know how to setup comptuer, don't hesitate to email us, we will send you picture how to install. 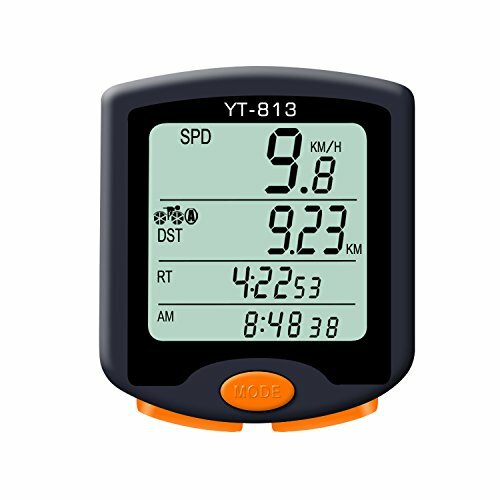 【White LCD Backlight Display】 4 Line LCD Display With White Backlight, Guarantees You Can Read Your Statistics Easily and Clearly Day or Night Riding. 【Wireless and Waterproof】Wireless Design Make It More Convenient and Advanced, Away From Tangled Wires On Your Handlebars. Waterproof Against Raining and Wet Condition. Works Anytime And Any Weather! 【25 Multi-functions】Distance, Maximum Speed, Average Speed, Driving Time, Calorie Consumption, Temperature, Stopwatch, Maintance and etc. Scan Function, No Need to Touch Buttons, show all information and stats automatically while Cycling. 【Applicable 】Mountain Bikes，Road Cycling, Folding Bike, Common Outdoor Bicycle, Electric bikes and motorcycle with 4 - 40 inches wheel. NOT SUITABLE INDOOR BIKE. 【Two Bike Setting & Date Comparison】Two Bike Setting & Date Comparison: Great for comparing recorded data between Bike A & Bike B for training and other purposes! You can pre-program all settings for two bikes (Bike A and Bike B). No more re-setting between 2 bikes! If you have any questions about this product by Nellvita, contact us by completing and submitting the form below. If you are looking for a specif part number, please include it with your message.